Our appointment was for Monday morning but we arrived Friday afternoon and spent a couple nights in a nice RV park just north of town. The weather was so different just 200 miles from where we left. The highs in Sutherlin were in the 70′s and it was still over 90 in Redding. We quickly decided we did not want to move further south yet, so after the seat was adjusted on Monday morning, we headed for Tulelake, CA. Tulelake is a tiny farming community in the Klamath Valley, just 4 miles south of the Oregon border. It gets its name from Tule Lake, an ancient shallow lake that was mostly drained in the early 1900′s by the Bureau of Reclamation and turned into rich farmland. This huge, shallow, marshy lake was a major stop on the Pacific Flyway for migrating birds, and they reduced it to approximately one sixth of its original size. Steps were subsequently taken to accommodate the birds, and there are now several wildlife sanctuaries in the valley. They have even worked out a beneficial system where various fields are flooded periodically to rejuvenate them, and the farmers in turn grow grains in such a way as to provide food for the birds. There really are a lot of birds on the lake. They estimate that about 250,000 ducks are in residence at the moment, but on an annual basis over 2,000,000 migrating geese, ducks and others call this area home for part of each year. It is interesting to see how it has all worked out to the benefit of the farmers and the birds. We visited the Visitor Center at the Wildlife Refuge, and hiked the nature trail through the marshes as well as the trail up Sheepy Ridge to the observation hut that was built by the CCC in the 30′s. The other thing of interest in Lava Beds is the history of the Modoc Wars. The Modoc were one of the last Native American groups to be rounded up and forcibly moved off their ancestral homelands. However, they did not go without a fight. The last battles were fought in an area of the lava beds named Captain Jack’s Stronghold. The volcanic formations provided an almost impenetrable fortress for the Modoc to hold off the soldiers. They were captured only after they left the stronghold, and they were relocated to Oklahoma. We have been very busy this past week, but it is time to move on. We have been staying at the Butte Valley Fairgrounds RV park in Tulelake, which has been a very laid back and pretty place to stay. Tomorrow we plan to move south toward Nevada, but not very quickly. It’s still way to hot further south. People often ask us, of all the places we have been, what area have we enjoyed the most. This area has to be close to the top of the list. 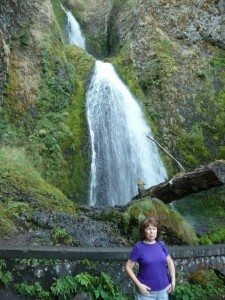 Sutherlin, OR is a small town of about 7,000 and Roseburg, which is only 10 miles away, has a little over 20,000. Roseburg has everything we need including Costco, Wal-Mart, Home Depot, Lowe’s, Joanne’s and every other chain you can name. Even more importantly, it has a major VA medical center. 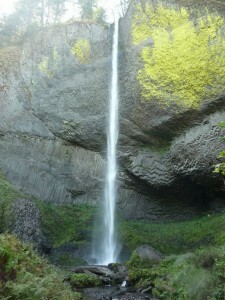 The weather in the area is as ideal as any place we have been and there is so much beauty around us to see. 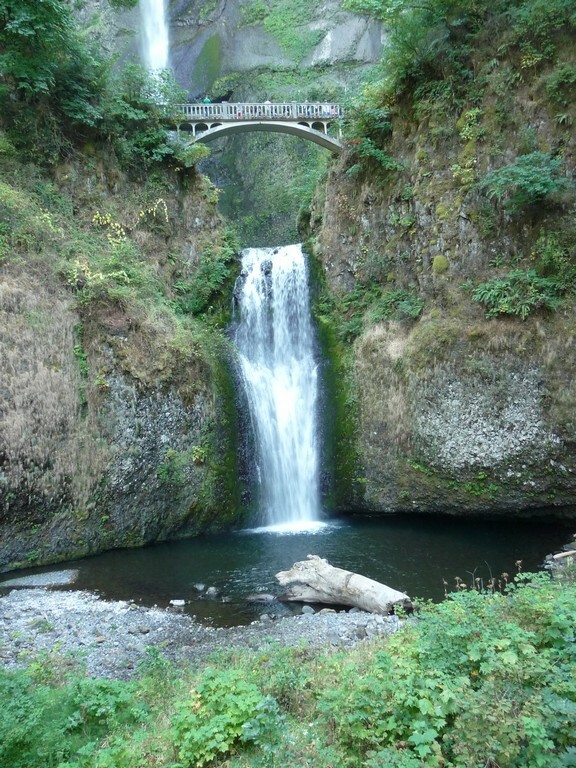 There are many lakes and rivers nearby, the beautiful Oregon coast is only 60 miles away, there are countless miles of scenic and well maintained roads for motorcycle riding, and the weather is temperate year round. Even the annual rainfall is less here than in other, wetter parts of Oregon to the north. We have often mentioned that we belong to the Escapees RV Club. 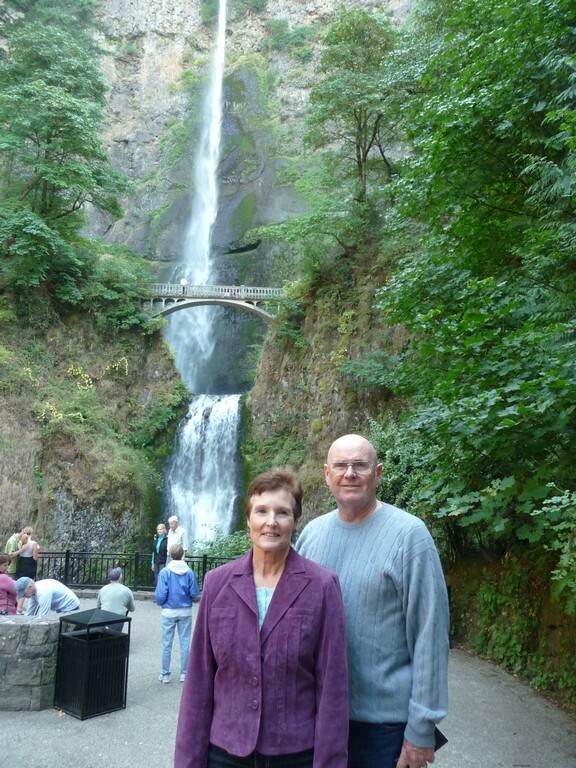 They are headquarted in Livingston, Texas and cater to full time RV’ers. The club was started by a couple who were full timers themselves. They saw a need for an organization to provide services to people like themselves. One of the club’s services we use is their mail forwarding service, but we also take advantage of some of the other benefits as well. They own and operate eight RV parks across the southern half of the US. These RV parks are always nice and very reasonably priced for members. We have stayed in many of them. During the early years of the club they also started several RV Park Co-ops. These were RV parks where the lots were “sold” to individuals. They were chartered much like condominiums in that the park is owned by the lot owners. Each park has a board of directors and makes their own rules to operate the park. The original idea behind the co-ops was to provide an opportunity for a “home base” for RV’ers who would stay on their lot for a few months at a time, and put their lot in a rental pool for use by other Escapee members when they were off travelling somewhere else. It is these rental pool lots that we have stayed in when we have visited in places like The Ranch near Carlsbad, NM, the Jojoba Hills park near Temecula, CA, Park Sierra near Fresno, CA and here at Timber Valley in Sutherlin. The lot owners are off travelling somewhere and we stay on their lots at a very reasonable price. When owners put their lots in the rental pool, they receive a portion of the rental income as an offset against their annual maintenance. Each park has its own formula, but owners who don’t spend much time in their site often have a large portion of their annual maintenance cost paid for. The most unique aspect of the Escapees co-op system is that you must sell your lot for what you paid for it, plus any assessments for infrastructure. Some parks have also added a small inflation adjustment over the years. Regardless, this approach keeps the cost very low. It also explains why there is a waiting list for almost every co-op. Some parks have waiting lists of over 10 years. The waiting list here at Sutherlin is 2 to 4 years. 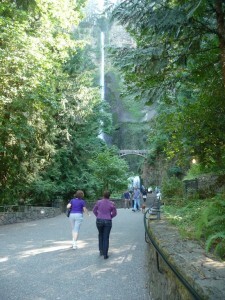 Owning a lot in a park like this makes good economic sense. You are essentially guaranteed your purchase price back when you decide to give up your lot, and the living expenses while using the lot are very low. People who live here year round, and there are quite a few who do, pay only their annual maintenance fee, electricity and propane. That rarely exceeds $250 per month. There are not many places you can live that inexpensively. Since this park does not add an inflation figure you do lose some value if inflation is high, but even with that the net cost is remarkably low. If you haven’t figured out by now, we have put our name on the waiting list here in Sutherlin. While we would not want to spend the entire year here, it is a wonderful place to spend some of it. As time goes on we find we like to stay put for longer periods of time. Spending our winters in Arizona near family is something we both enjoy, and spending holidays with our kids is also important to us. And, as I said, there are still many places around the country that we want to visit. How long we actually will stay in Sutherlin in the future is unknown, especially since it will still be a while before we get our lot. Much can change in the meantime. We’ve talked at length about where, when and if we might want to eventually settle down. At this point we have no plans to do so. When it happens, we think it will be near one of our kids, but we don’t want to live where either of them lives right now. We enjoy being able to spend a month or so with them at times, but North Texas is too hot in the summer, too cold in the winter, and has tornadoes in the spring. Chattanooga is also too hot, cold and humid much of the year. When health issues force us to make a change, we will deal with it. But in the meantime, we plan to continue our vagabonding ways. Monday we made a trip north to Vancouver, WA. 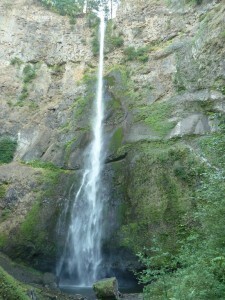 It is located just across the Columbia River from Portland and is about 175 miles from Sutherlin where we are staying. Dianna’s Jr. Hi. girlfriend, Sue Spink, lives there. We stopped by to visit her on our way back from Alaska in 2007. Sue invited us to come up and spend the night so she could show us around. 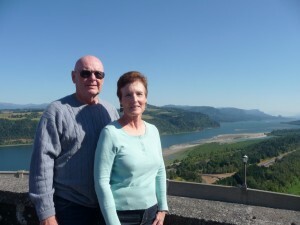 From Sutherlin we traveled north on I-5 through the Calapooia Mountains that run East and West between the Cascades and the Coastal Range from The Umpqua River to the beginning of the Willamette Valley at Eugene, OR. The part of Oregon from Grants Pass north to Eugene is all mountainous and very beautiful, but the Willamette Valley is just a wide flat agricultural plain, much like the Central Valley of California. Nearing the Columbia River just south of Portland the terrain changes somewhat. It’s mostly hilly and forested again. The lava flows from ancient volcanoes and the action of the Columbia River have sculpted the area into an interesting and scenic place to see. Monday afternoon we spent a lot of time visiting before Sue took us to Fort Vancouver on the banks of the Columbia. There is a lot of history there involving the land claims between the US and Canada when the area was first settled. Unfortunately we arrived too late for the visitor center, but it was fun just looking around. We too the opportunity to introduce Sue to geocaching. We struck out on several caches that had apparently been muggled, but we finally found one attached to the bleachers at a little league field. It was the tiniest cache we have ever seen. It was about 1/4 inch in diameter and 1/2 inch long. It was not a micro — it was a nano! 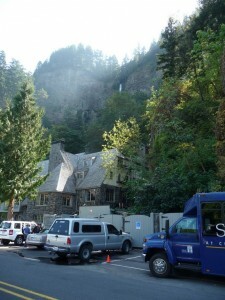 The visitor center and restaurant at Multnomah Falls. We ate in the view room and had an excellent view of the falls. The lower falls and the walking bridge above. I checked Craig’s list for several days, looking for a used trolling motor. Most were too small, too old, or not set up for stern mounting. One showed up on the list last weekend in Medford, about 100 miles south of us. It was just what we were looking for so I made the trip down and back on the scooter. I’m sure it looked funny with the motor lashed on to the back. It stuck straight out, not down, but still it had to get a laugh or two from other motorists. We tried out the setup on Wednesday. The boat fits in the trunk of the car and we can set it up or take it down in about 15 minutes. Out on the lake the motor pushes us along at 4-5 miles per hour at half throttle. It appears that the battery would last about 3 hours or so at that speed. That’s plenty. I tried it wide open for a bit. We probably moved along at 8-10 miles per hour, but the battery would not last more than an hour at that speed.. We motored from one end of the little lake near us to the other and back, exploring each cove and beaching the boat for a while in one nicely shaded spot. The nice thing about our setup is that we can still paddle when we want to. We did some paddling, especially when we got into some shallow areas, but when we got tired or when we turned into a headwind, it was really nice to just twist the throttle and let the scenery slide by. I think we’re going to enjoy it. Yesterday we took a motorcycle ride to the Oregon Coast. We went with one other rider who lives here in the park and loves to ride. He has made the trip many times. We followed the Umpqua River all the way to the coast, about 60 miles away. We took a side trip to Loon Lake where we had lunch on the patio overlooking the lake, then stopped again to watch elk wandering about in a meadow. We arrived in Reedsport and turned south on highway 101 to Winchester Bay where we again took a side trip out to Oregon Dunes National Recreation Area. This area has one of the largest coastal sand dune areas in the country, and the place was crawling with ATV’s. It was interesting to see and it looks like it gets lots of use in the summer time. We continued south to Coos Bay where we stopped for blackberry pie and coffee, then on to Coquille where we turned east and rode back through the coastal mountains to Roseburg and back home again. The total trip was almost exactly 200 miles. This was our first trip with the new seat, and it worked great for me. Dianna is thinking she might like to have a minor adjustment to the side of the seat, but we’re going to wait until we are past the break in period before we do anything. We’ll probably make another trip or two to the coast while we are here. We would like to explore a little more on our own, and take a few photos. There was a lighthouse we would like to visit and many other things that we would like to check out.